Remember, Remember, this second book in the DC Nina Foster series (now optioned for a major TV drama) is a taut and gripping police procedural crime novel. Returning to work after recovering from a serious injury, the feisty and determined policewoman is initially assigned to a desk job to keep her out of harm's way. But as she re-visits the investigation of the infamous 1964 Wickerstead Valley train crash, she finds new evidence that might link that fatal accident to a current spate of heroin-related deaths. Tracking down witnesses, she comes face to face with the notorious Rumbly family and uncovers a network of drug dealers who will stop at nothing to protect their criminal empire. With danger mounting at work, Nina's mental and physical capacities are tested to their limits; her home life begins to suffer and she struggles to make time for the new man in her life, Bill Harrison. 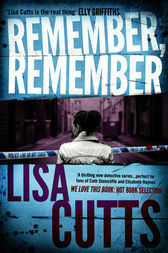 Brilliantly plotted and fast-paced, Remember, Remember confirms Nina Foster as a heroine for our times and cements Lisa Cutts' reputation as an author of gripping fiction straight from the frontline of modern policing.